Round-trip engineering is the ability to generate model from source code and generate source code from UML model, and keep them synchronized. You can make use of round-trip engineering to keep your implementation model and source code up-to-date, so as to produce up-to-date description on your model. Select Tools > Code > Reverse Java Code… from the toolbar. 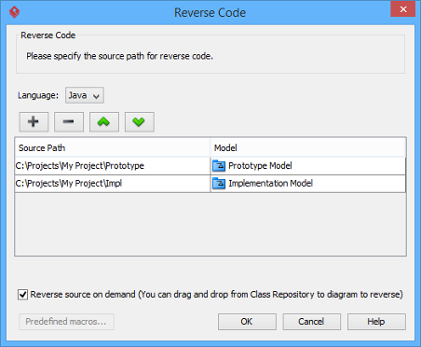 In the Reverse Code dialog box, specify the mapping between source path and model. Model is a UML element that acts as a container of other elements. You can place the UML classes to be produced to specific model for better categorization. For example, you may create a Prototype model and an Implementation model for storing classes developed in prototype and implementation phrases respectively. Once a mapping is defined, round-trip engineering will be performed between the model and path as defined. You can add multiple Source-path-to-model mapping by pressing the + button. If you do not use model to structure your project, keep model to be <root>. By default, an on-demand reverse engineering will be carried out, which means to form indexes to the added path(s) instead of actually reversing them. For details about on demand reverse engineering, refer to the section below. If you want to carry out actual reverse engineering, uncheck Reverse source on demand. Click OK to proceed with reversal. Once you have performed round-trip engineering for once, you can update UML class(es) on a diagram from source code for reflecting the changes made in code. To update, right click on the background of the class diagram for update and select Utilities > Java Round-trip > Reverse Code from the popup menu. Note: In order to trigger this function, make sure you have performed round-trip engineering at least for once and the diagram has at least one class. Once you have performed round-trip engineering for once, you can update specific UML class(es) from source code for reflecting the changes made on that particular class(es) To update, select in class diagram the UML class(es) you want to update. Right click on them and select Java Round-trip > Reverse Code from the popup menu. 1 Language The programming language of the source code to reverse. 2 Add source-path-to-model mapping Click to add a new mapping between source path where code will be reversed from and UML model. 3 Remove source-path-to-model mapping Click to remove chosen source-path-to-model mapping. 4 Move source-path-to-model mapping up Click to move chosen source-path-to-model mapping one item upward. 5 Move source-path-to-model mapping down Click to move chosen source-path-to-model mapping one item downward. 6 Model-to-source-path mapping A list of mapping between UML model and source path. 7 Reverse source on-demand By checking, this means to form indexes to the source path(s) instead of actually reversing them. For details about on demand reverse engineering, refer to the section below. 8 OK Click to start reversal. 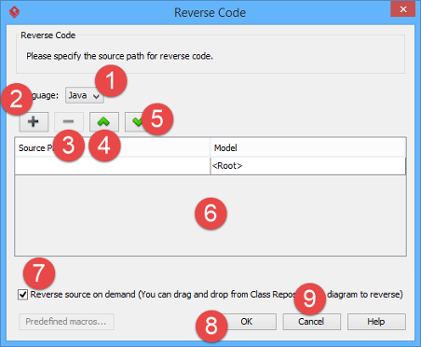 9 Cancel Click to close the Reverse Code dialog without reversing code. Consider if you have a project that contains million of Java source file, and now you want to re-develop just a few classes in it. If you try to reverse the whole project it will take you a long time to complete the reverse due to the amount of classes (and relationships) are just too many. With on-demand reverse engineering, you will reverse the sources as indexes, and obtain an index tree in class repository. No actual UML classes will be reversed until you trigger the reverse manually. This reduces the processing time significantly. To perform on-demand reverse engineering, make sure the option Reverse source on demand is checked in the Reverse Code dialog box. When finished reverse, you can lookup the index tree in class repository. Then, right click on the class you want to reverse and select Reverse Resources to where Resources are the classes you have selected, and select either New Class Diagram or Class Repository from popup menu. Both options will result in reversing the selection to UML classes, while the option New Class Diagram will create a class diagram and place the classes in it.